We have 5000 beta tokens to give away that could warp you into a weekend beta event for the upcoming MMO, RIFT. Oh yeah, and you can win an uber gaming laptop from Origin PC or the GeForce GTX 460 video card from Nvidia! RIFT is the complete MMO experience you've been waiting for! Dynamic conflict and a revolutionary class system await you in this world besieged by the elemental planes. We have 5000 tokens to give away, each having a chance to get into the upcoming weekend beta event. We also have 250 VIP keys that will grant you access to every RIFT beta event. And because we want to let Trion and everyone else to know who is the best community around, we are ready and waiting with a The Escapist guild in-game. To sweeten the pot, there is a 17" Gaming Laptop from Origin PC on the line for US participants. As if that wasn't enough, Trion is also holding a Beta Challenge with a chance to win the Nvidia GeForce GTX 460 video card. Please note, these tokens are a chance to be asked to join the weekend beta event. While you can be any age and live anywhere just to log in and be part of the fun, you must be at least 18 years of age and a resident of the US to be eligible to win the Laptop. Trion has their own list of rules for their Beta Challenge, which can be found here. 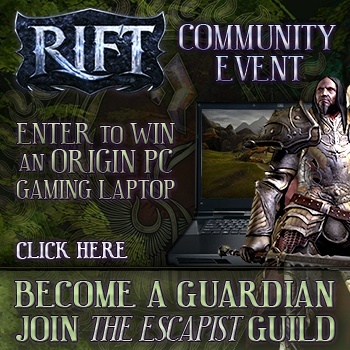 Become a Guardian, join The Escapist guild and let us save Terala! Click here to visit the main contest page and get your key.